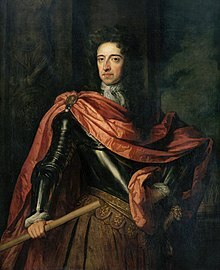 As King of England, William III would be addressed as Your Majesty or sire. Darley Arabian, one of the foundation sires of the thoroughbred breed of horse. A lord, master, or other person in authority, most commonly used vocatively: formerly in speaking to elders and superiors, later only when addressing a sovereign. A male animal; a stud, especially a horse or dog, that has fathered another. (obsolete) A father; the head of a family; the husband. (obsolete) A creator; a maker; an author; an originator. (transitive, of a male) to procreate; to father, beget, impregnate. In these travels, my father sired thirteen children in all, four boys and nine girls. From Old French sire (nominative form), from Vulgar Latin *seior (used as a term of address), a contracted form of Latin senior (compare French seigneur, derived from the accusative form), perhaps influenced by maior. Doublet of senior. “sire” in le Trésor de la langue française informatisé (The Digitized Treasury of the French Language). Borrowed from Old French sire. See also sere. Doublet of signore. This page was last edited on 26 March 2019, at 07:43.